Synthesis means 'putting together' and here we bring the various themes into a coherent and self-consistent theory of life: what it is, what makes it unique, how it works and how it relates to the wider universe, both in origin and function. This is of course a work in progress, so this page will change as new understanding is integrated into our developing understanding. What you see here is the current position in summary. From the deep theory, we understand that the physical existence of identifiable things in the universe is the effect of organisational structure acting on material (including energy) in space and time. The organisation is essentially information, which to exist, must be embodied in material (information cannot exist without material). Here the word ‘information’ does not refer to information about things, but to the physical information embodied in the form of things (information). By being embodied, it in turn gives identity to material objects by giving them form, especially a boundary where they begin and end: for example a chair rather than a lump of wood. Information creates form and form embodies information. The universe began with very little information and hence little structure, but over time as patterns interacted, a process of self-assembly emerged in which higher levels of organisation emerged from below. Often enough, this process of organisational emergence caused material self-assembly. The information embodied in the universe has formed into a 'Russian doll' of nested hierarchy in organisation: each layer spontaneously creating the one above it as 'emergent properties' arise from the complexity of interactions among its components. This information perspective encourages us to think of life as continuous with the abiotic universe. It is the most advanced organisational structure known to-date: not a separate 'marvel', but the latest elaboration of the growing complexity and emergent organisation of the universe as a whole. From thermodynamic study, we know that as well as organisation and material, there is a dynamic flow to life. The third key aspect of life is dynamic action. This is essential because the tremendous organisation of living systems is unstable, requiring constant effort to renew and maintain it. Part of the essential structure of living systems is the organisation of processes needed to constantly renew and repair disintegrating organisation. Living systems are dynamic and need to constantly pump entropy out of themselves by pushing it into passing energy. For this, they are termed dissipative open systems (using concepts from thermodynamics) and energy consumers (though they do not consume energy, they merely 'disintigrate' it as it flows through them, gaining 'integration' (organising constraint) from the balance of its loss. This keeps the laws of thermodynamics: in a closed system (or overall), entropy always increases. Thus (as the visionary writer Fritjof Capra wrote in The Web of Life - Flamingo 1997) life is the combination of three major aspects: organisation, material and process. Life is a phenomenon of the ‘perpetual organisation of matter’: it is dynamic, but held together in precise and complex organisation. This organisation is special because it orders matter into a dynamic system that is self-contained, making an identifiable whole from a collectively autocatalytic set, capable of maintaining and making copies of itself, capable of independently ordering energy into work to achieve this, and capable of making and running programs which give it autonomy. Possibly this autonomy is the most characteristic observable feature of life, distinguishing it from all non-life. It is obvious and familiar already, but so difficult to express in objective and scientific terms, that it has largely been ignored up to now. Autonomy occurs at the tegument separating the living from the non-living, where cause and effect are transformed into signal and response. From autonomy, the concept of function arises. This has troubled modern scientists because it seems to imply a teleological purpose Life seems to have been built via a spontaneous increase in complexity, caused by repeated combination of formative patterns such that they give context and thence function to one-another. Chemistry is the result of this process at the atomic scale and life is a branch of chemistry that is especially rich in opportunities for functional combinations. The processes of life are chemical processes, so our ‘life is information’ remains compatible with Kornberg's ‘life is chemistry’, but goes deeper by highlighting the informational basis of the chemistry of life. Our perspective also emphasises the idea that the all organisational scales of life have a role in self-maintenance and reproduction. Considering life as information processing (computation) where the subject of computation is living, we are faced with a `program' running on itself, whose function is to output itself. This sort of recursion is familiar and much exploited in computer science. It highlights the fact that for life, there is no distinction between the ‘machine’ and the program - both are information; they are the same information, ordering and re-ordering matter and energy so as to persist. It would not be right to think of life as a biochemical structure on which a program is run, because life is the program and the biochemical structure is its embodiment. This is why we say that information is not just in DNA, but is in the whole biological system. In secondary school (and sometimes even university) students are tought to define life by listing a set of attributes. As you can see in the table below (and there are lots more examples) none of these attributes are exclusive to life. The last one "evolution" is admitedly a bit of a cheat, since ideas are normally the product of minds, which in turn belong to living organisms, so in a way are themselves artefacts of living (same goes for WWW, but we could substitute the weather there). However, the principle of ideas as a purely informational constructs which, given a suitable medium in which to flourish, will naturally compete and change in response to 'stresses', so undergoing evolution by natural selection. This is the hardest attribute to find in the non-living world, but it is not impossible. Indeed, it is only when we consider the apparent autonomy of living organisms, that we find something truely unique. Possibly modern biologists have been reluctant to emphasise autonomy because they are uncomfortable with something that seems counter-reductionist and not easily defined. But now, this autonomy can be explained in rigourous terms using cybernetic concepts such as downward control : the paradoxical phenomenon of emergent structures exercising control over their component parts (this idea was pioneered in biology by Denis Noble). It is entirely consistent with the idea of autopoiesis (see below) and can, in principle, be quantified by of information theory metrics. The 'Sandiago Model' of life, which introduced autopoiesis, emerges naturally as the core of an information approach to what life really is. As Maturana says: " living systems are not the molecules that compose and realize them moment by moment, they are closed networks of molecular productions that exist as singularities in a continuous flow of molecules through them. Their closed dynamics constitute them as separable entities that float in the molecular domain in which they exist". I think he is describing living systems as transcendent complexes here. The information embodied in the universe has formed into a 'Russian doll' multi-layered structure in which each layer spontaneously creates the one above it as 'emergent properties' arise from complexity. This is by far the most elaborated in and by life, but why? Our understanding of the phenomenon was advanced by the concept of functional equivalence sets and the context downward causation put forward by, especially, George Ellis and colleagues. From this we understand elemental processes of life: homeostasis, anabolism, replication and work generation as information processes existing at a level of organisation greater than the chemical reactions constituting them. The business of information processing is commonly termed computing, but the computations of life are particular in that they are cybernetic. This should be no surprise since the pioneers of cybernetics (Wiener, von Neumann, von Foerster, Bateson and others) originally set out to understand the relationship between life, organisation, control and information. Our perspective emphasises the idea that all organisational scales of life (from molecule to ecosystem) unite in self-maintenance and reproduction. The subject of this cybernetic computation is living: life is a `program' running on itself, whose function is to output itself. This sort of recursion is familiar as autocatalysis (now it is the autocatalysis of information - a realisation first stated by Stuart Kauffman). It highlights the fact that for life, there is no distinction between the `machine’ and the `program’ - both are functional information. All information must be instantiated and embodied by differences in physical matter and/or energy. The program and the embodiment of life are both the same information: life is the program and the biochemical structure is its embodiment. Stuart Kauffman realised, and has since emphasised that to be living, a system must be able to “complete at least one thermodynamic cycle”. His deeper insight was that life was made from a self-maintaining organised open non-equilibrium system and that the maintenance of its organisation required work to be done and that in turn requires the system to be an engine (i.e. a system which performs thermodynamic work cycles so that it 'pumps' entropy from within itself, sending it off in the energy that it draws through itself - oxidation and energy transfer by ATP<=>ADP enables this in practice). Self maintenance of a system means that it has to be formed of an autocatalytic set, so, combining the two, it must be an autocatalytic engine: every living cell is an engine that makes itself. The great insight was that in life, organisation catalyses organisation. From classical thermodynamics, we know that the flow of energy is made to do work only when it is constrained in degrees of freedom by organisation of matter. The work obtained can be deployed in creating and maintaining this organisation of matter. Therefore a general truth about living systems is that they are engines, whose work is used to make and maintain the organisation of the engine itself: work is enabled by constraints and the constraints are maintained by the work obtained. This thermodynamic understanding shows one of the essential requirements for life as autopoiesis: supplying from within all the work needed for self making and self maintenance, which implies the work of an engine whose primary function is to maintain itself. 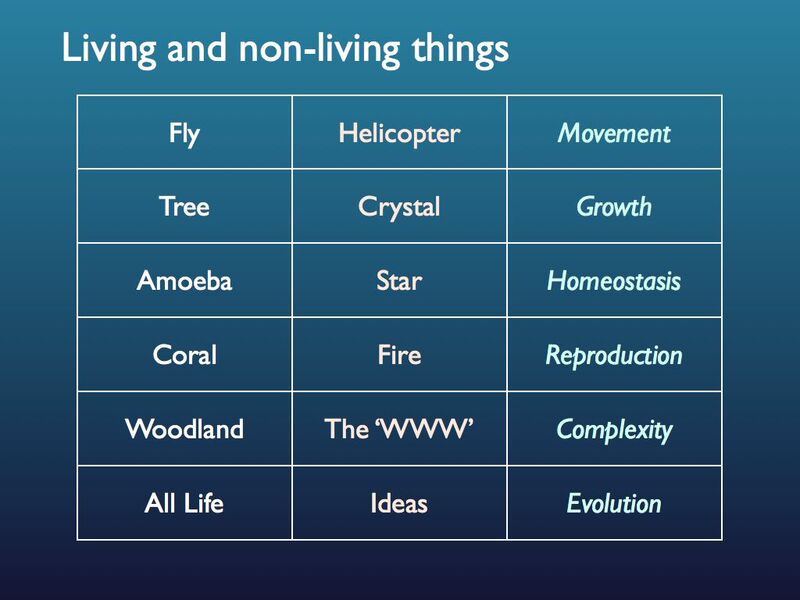 The critical divide between non-living and living things is where thermodynamic causes for self-assembly change to organisational causes (especially downward causation by information). For this to happen, part of the organisation must be a system for performing thermodynamic work cycles. This in turn must be part of a network of causal relationships that includes closed circuits to create circular causality. Given this, it will have a degree of causal independence and therefore it will have its own identity. For practical reasons it will have a physical boundary as well (one of the essential characteristics of an autopoietic system as conceived by Maturana and Varela - see below). So, what makes life different from every other complex system phenomenon? At this point, in the first half of 2019 (I did say we would update this page as we discover more), it seems that autonomy is the single characteristic that sets the living apart from the non-living. Only with autonomy can a system be itself because autonomy is necessary for the definition of self. No system can be causally separate from the rest of the universe, other than being autonomous and therefore no system can have an identity other than by being autonomous, as we have defined it. Given autonomy, a system able to work as an engine can deploy the work obtained to maintain itself as an organisationally distinct system. It can assemble itself by means that are independent of the wider thermodynamic imperitive. In other words, it's self-assembly can be independent of thermodynamic causes, which are the ultimate drive of the universe as a whole. Life is essentially a cybernetic (informational) process, one which creates and maintains circular causality, including that which forms a system in physical components (biochemistry) that generates physical work, this being the independent source of negative entropy that is practically needed for autopoiesis. Life is an algorithm running on biochemistry (wetware), the function of which is to create and maintain itself. That is the reason we need to describe it in terms of information theory and thermodynamics in order to truly understand it. The most profound and essential unique feature of life is causal autonomy; probably (not yet proven) all its other features follow from this one. "While in the attempting to answer the dual questions of what kind of systems are living systems, and of how did they begin so that I could now speak of their origin, it became obvious to me that living systems exist as autonomous entities in the form of self contained closed molecular dynamics of self production, open to the flow of molecules through them. Indeed, one can say that living systems arose in the history of the earth in the moment in which some spontaneous networks of molecular autocatalytic processes became closed upon themselves. This happened when, as a result of their own dynamics, they became singular separable entities that realized their boundaries as a consequence of their own operation, and existed in that way as autonomous totalities in a molecular medium with which they were in recursive molecular interchange. "- Humberto Maturana Romesin. Cells compute using networks of molecules (mostly enzyme switches), but what are they computing? The answer is homeostasis and reproduction and the filtering needed to select what is needed from the environment for growth and maintenance. This is the machinery of autopoiesis. In a multi-cellular organism, networks of cells with different specialisations are computing by communicating information, filtered or amplified, in cascades reminiscent of the activity of artificial neural network computations. They too are running the algorithms needed for homeostasis and reproduction which constitute the ‘perception’ to select what is needed from the environment for growth and maintenance. If the organism has a nervous system, this will add extra computing power, via additional and complimentary ‘wetware’: neural networks do the same job as cell-signalling networks, but more effectively so as a result of the specificity of connections that can be achieved. 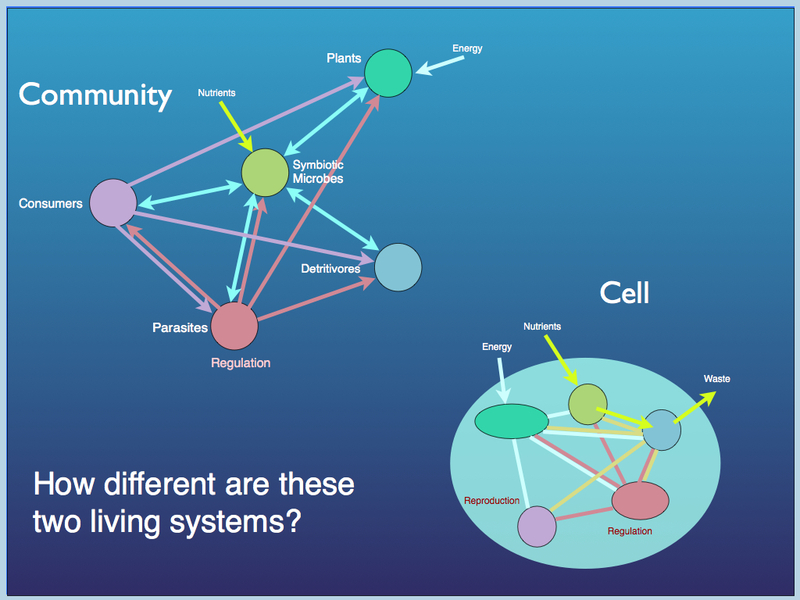 Now, what of a network of organisms: an ecological community? This too is a computer constantly solving the ever changing problem of homeostasis and reproduction: selecting what is needed from the environment for growth and maintenance. The organisms specialise in different aspects of the process (functional roles) and link together in networks that are essentially (in information terms) similar to those of the molecules in a cell. At each level, we see computation over a network of specialised components. The theory of autopoiesis (self making and self maintenance) was originally conceived for a single cell by Maturana and Varela (published in 1980). The basic requirements for life, of homeostasis and growth, are true also for the community of cells in an organism and for a community of organisms in an ecosystem. Since all life shares this common requirement, at all levels of biological organisation, it can be used as a unifying principle. Indeed, all life can be seen as one elaborate multi-cellular complex. Human society has developed through increasing specialisation of task, so that the efficiency with which each person does their job increases - this leading to a surplus of production that can be reinvested as population growth. So it is with cells: first specialising into a community of symbiotic partners, then forming distinct organisms, the division amongst which is just an elaboration of the division of labour among cells. An ecological community is an elaborate network of cells, many taking part in organisms, but all working as a homeostatic network, manipulating and taking what it needs from the abiotic environment to perpetuate autopoiesis through information processing.